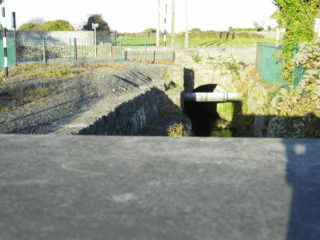 The bridge on Barrack Street crosses the canalised portion of the Oranbeg River, known as An Trinse Mór, the big trench. It was diverted by lord FitzGerald and Vesey to drive the water wheel in his brewery adjacent to his large house, Vesey lodge. As the local landlord he owned hundreds of acres in the surrounding townlands. no trace of either Vesey lodge, which was demolished in the 1960s, or the brewery, remain. I was born and raised in Vesey Lodge, and would like you to know that there are two aditional archer to the east of the Oranbeg bridge. These were part of what must have been an elaborate system that was there in relation to the Brewery/Distillery that had been on the site. The arches were at the end of two tunnels which ran from the premises and must have been used to channel water to diverse mill races. I used to go into one of these tunnels from Stephen Furey’s field, however it was blocked by the foundations of the wall east of the bridge. My father, Paddy Curran, made an opening into one of the tunnels in order to relieve flood water which flowed from the road and down into our yard.